The name Waikīkī means spouting fresh water in Hawaiian. 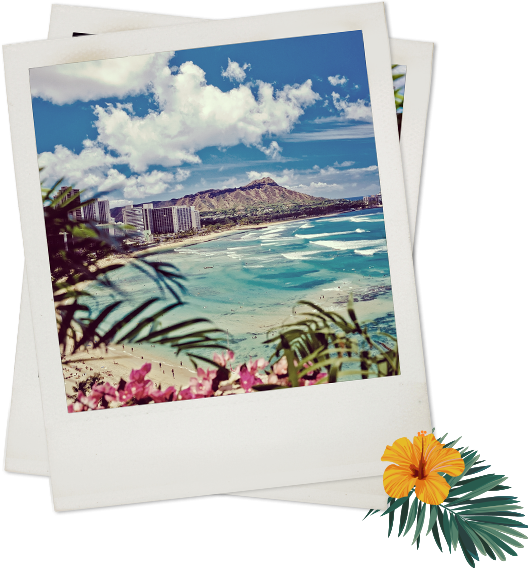 Located on the south shore of Oahu, we are the home of six beautiful beaches. A famed retreat for Hawaiian royalty in the 1800s, Royal Grove Waikiki adheres to the tradition of hospitality and friendliness familiar with the people of Hawaii. With our rich culture and history in mind, we invite you to our humble hotel located minutes from Waikiki Beach. "Out of the water, I am nothing." Kahala Beach is the perfect kid-friendly and quiet beach for an afternoon picnic or just some fun in the sun. Escape the beach crowds and visit beautiful Queen’s Beach. You want to see a view of the sunset at Kuhio Beach. A true hidden gem with a grand boardwalk and accommodating parking area. Enjoy a beautiful beach with a barbecue area and outdoor seating. A great beach to relax and soak up some sun. Named for a local legend, Duke Kahanamoku Beach never gets overcrowded. If you haven't tried Japanese BBQ yet, now is your chance. Cook your own meats, veggies, and desserts over a grill in the center of your table. This social dining experience shouldn't be missed. One of the first restaurant in Hawaii, this eatery offers traditional favorites with new American flare. Located in the International Marketplace, this is a must-hit dining spot on the island. A fun and lively spot to enjoy dinner or lunch on the beach. Tikis offers all of the classic beach cuisine with some upscale options. Taste the best in French and Hawaiian cuisine with aged steaks and locally sourced seafood dishes as the main attractions. Sit in the open-air dining room to take in the beauty Hawaii has to offer. An upscale dining experience with white table cloths and luxury seating make this steakhouse the perfect place to celebrate a special occasion or enjoy a romantic dinner. Inventive sushi rolls, hand rolls, and Japanese cuisine make Doraku a favorite spot for all sushi lovers. Try their late-night bites, happy hour specials, and more. Royal Market has all the upscale and luxury items you're looking for. Shop a variety of stores offering fine gifts, luxury clothing, handbags, shoes, and more. This 60- acre community is a great place to enjoy an afternoon of shopping and dining in an urban setting. Shop beauty products, children's apparel, homegoods. You'll even find specialty stores like Red Pineapple and Sedona. Featuring pearls from genuine saltwater cultured oysters. Choose from over 120 settings to showcase your pearl. Hilton Hawaiian Village and International Marketplace. You'll find an incredible array of vendors offering every souvenir or gift you can imagine for family and friends back home. Located in the heart of Waikiki for more than 30 years. Discover delights. Stroll through a sea of possibility. This is where you can browse for genuine Hawaiian keepsakes, authentic local crafts or the latest in trendy fashions. Surrounded by a lush landscape and lofty glass canopies this is shopping island style. From urban-chic to island-funk, shoppers will discover worldly fashions as diverse and cosmopolitan as Hawaii itself. Shop in unique antique stores, small boutiques, and find all the gifts and trinkets to give your loved ones when you return from your vacation to Waikiki. Visit a piece of national history at the site of Pearl Harbor. You can visit the USS Arizona Memorial and tour the museum to learn more about our nation's history. Founded in 1904 and administered by the University of Hawaii since 1919, the Waikiki Aquarium is located on the shoreline of Waikiki Beach next to a living reef and across from Kapiolani Park. Showcasing more than 500 marine species with more than 3,000 marine specimens, the new Hawaiian Green Sea turtle exhibit, and Peppermint Angelfish, one of the Ocean's rarest fish. Learn all about Hawaii's culture through a fun and educational museum offering iMax movies and guided tours. You'll also find fun gifts and food at this popular tourist attraction. Experience Hawaii's only real submarine tour! Create lifetime memories diving into the habitat of countless, exotic sea creatures in the comfortable and safe submarine. Marvel at sunken aircraft and shipwrecks and the "new homes for fish" Atlantis creates through its impressive reef development activities. Explore the battle in the skies in Hangar 37, a 42,000 square foot airplane hangar that survived the Pearl Harbor attack. See planes like an authentic Japanese Zero and a B-25B Bomber, similar to the one used in the famous “Doolittle Raid” on Japan in 1942. Gain a new perspective on the war at the Pacific Aviation Museum. Learn more about the Pacific Aviation Museum. The Zoo is 42 acres and home to 995 different animals from the tropics. Komodo Dragons, orangutans, elephants, primates, birds, reptiles, amphibians, and a variety of African animals can be seen daily. Be sure to see the wildest place in Waikiki! © 2019 Royal Grove Waikiki. Sign up with your email below to receive exclusive offers and savings.